Die Peperboom B&B is situated on the outskirts of town on a huge property with lots of trees and birdlife. Two identical selfcatering chalets with underroof parking next to your door and your own braai facility in front of the chalet. 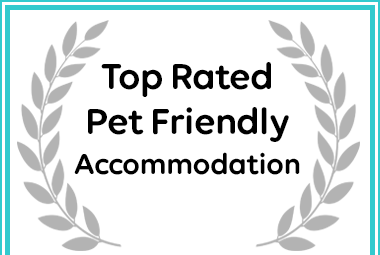 Die Peperboom B&B in Victoria West received a Top-Rated, Pet Friendly Self Catering Destination Award. Each chalet consist of a bedroom with double bed , seperate bathroom (shower only or shower over bath) and bunkerbed in the livingroom as well as a 2 x single sleepercouch (one bed sliding from beneath the other) which is used for families with 3 or 4 children. The livingroom has a fully equipped kitchenette with 2 plate stove, microwave and barfridge. Air-conditioning and a swimming pool make the summer heat bearable and in winter the panelhaeters in bedroom and livingroom as well as electric blankets on the double beds keep you warm. Included in the rate is the light breakfast of two cereals and homemade rusks with milk, tea, coffee and sugar which is already in chalet at arrival. On entering town via the N12 from Beaufort West/Three Sisters, Die Peperboom is the second property to the right. From Kimberley/Britstown in the north, stay on the N12, go right over the four way stop and find Die Peperboom on you left as you leave town on other side ( exactly 700 m from 4 way stop). The streetlights are already behind you !